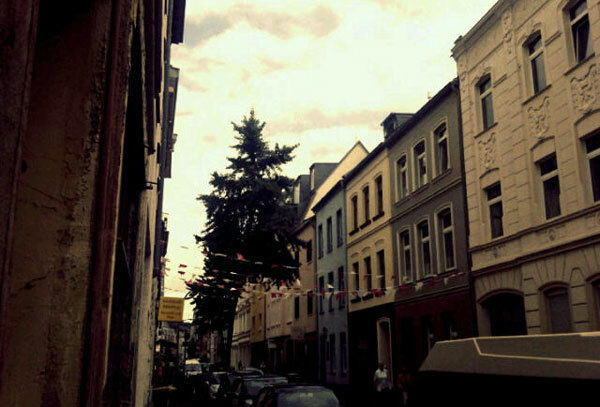 Cologne is not bursting with a culinary culture. 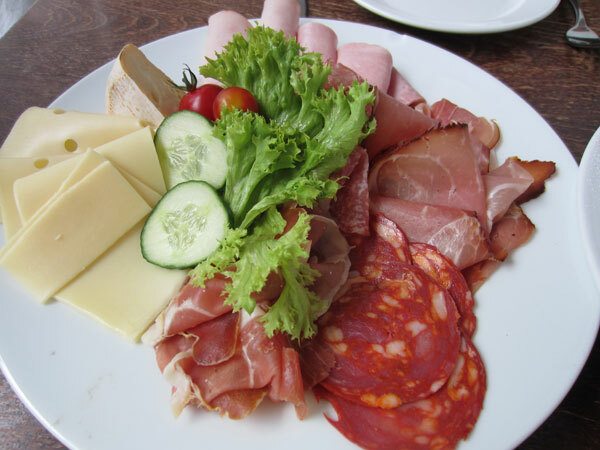 It is the third biggest city in Germany and ticks all the boxes on the German foods stakes. Sausage…tick. Schnitzel….tick. Strudel….tick. Beer….BIG tick! But I was determined to find a cool brunch spot in this beautiful city. Cafe Sehnsucht was my answer. 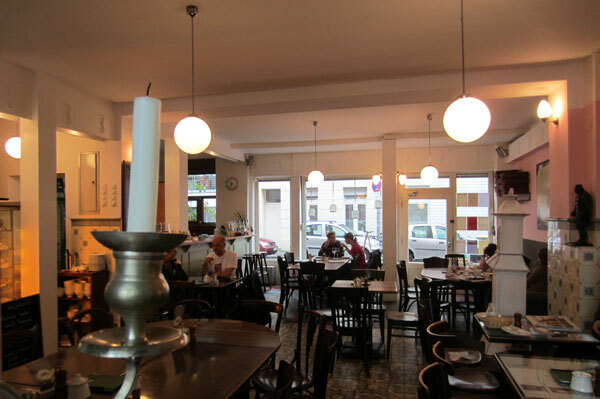 Located in Ehrenfeld, west of the city this cafe is tucked away in an unassuming neighbourhood and on a quiet street suggesting this spot is a local treasure! And it is uber cool! 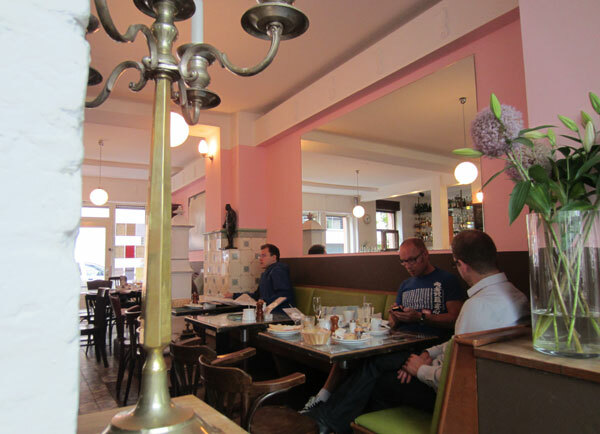 It has an old world vintage vibe to it with dark wooden tables and chairs and chic lime green leather banquettes. Tiled floor and wall panels which you see quite often in Germany and super cute crystal light fittings hanging in the window. All of this very appropriate as I have since found out that the word ‘sehnsucht’ is German for nostalgia! We sat to the rear of the cafe which opens out as a sun room and then to an outside courtyard which would be lovely to enjoy on a warm day – sadly it was raining on this particular day! We were presented with a menu and some loose sheets which listed all the breakfast items with a tick the box selection – I have only ever encountered this system when ordering dim sum! Obviously the menu was in German and when I inquired about an English version I was regrettably declined. Nevertheless I took this as a good sign that not many tourists find this little gem. So with some rough translations from our waitress we ticked some boxes and crossed our fingers! Pictured above is what we thought would be three different varieties of omelette! Clearly we need to touch up on our German! However our meat and cheese plate was delicious and we enjoyed it with some very tasty pumpernickel bread. 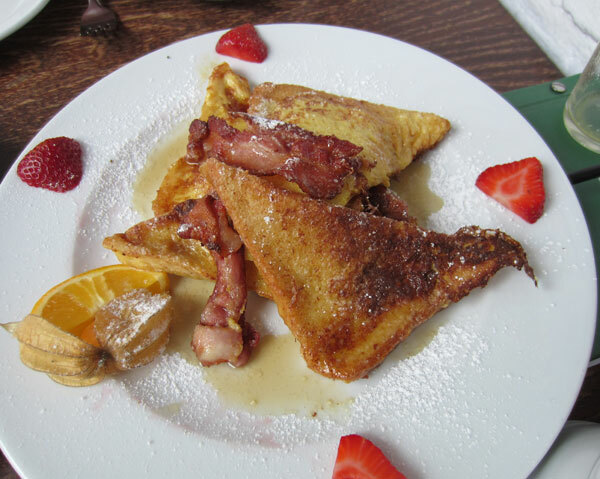 We were relieved to be served the French toast because surely that can’t be lost in translation! It was delicately fried and served with bacon, maple syrup and fresh fruits. And sufficiently eggy to kind of make up for our non-existent omelette!! I was rather excited to find ‘Rhabarber’ juice on the menu! 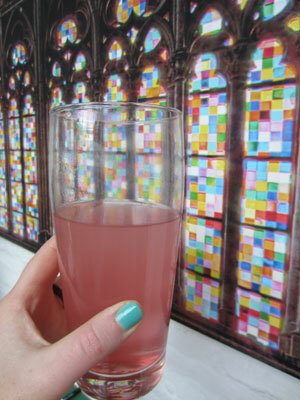 It was slightly carbonated and seriously good! So in Germany I shall be known as Fraulein Rhabarber!! After brunch we wandered down the street and stumbled upon this charming coffee bar. 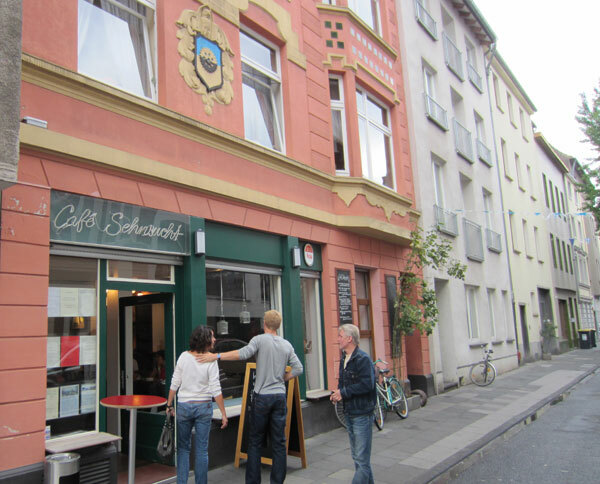 Having experienced a very disappointing coffee at Cafe Sehnsucht we were willing to give the German’s another chance to redeem their poor coffee reputation. And the results were good! Still a touch on the milky side but the coffee was robust. 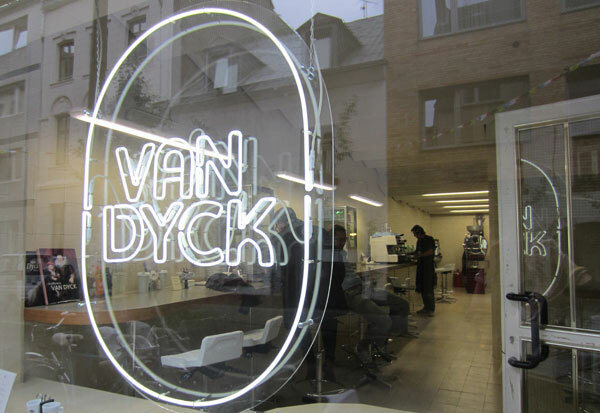 This little coffee bar, which from what we could tell is all that it serves up, exudes a very sleek even clinical vibe. I liked it! 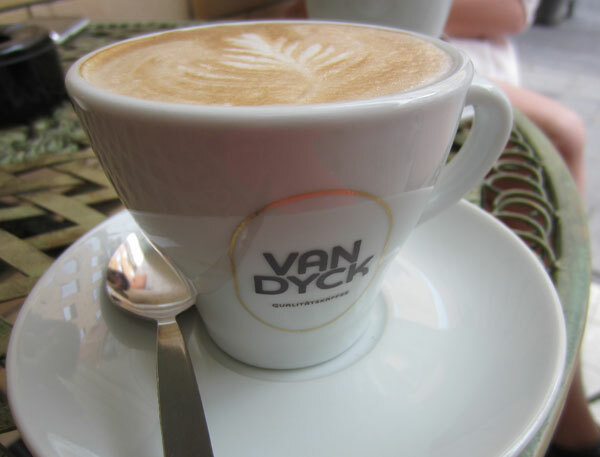 So don’t bother with the coffee at Cafe Sehnsucht and save yourself for Van Dyck’s brew. 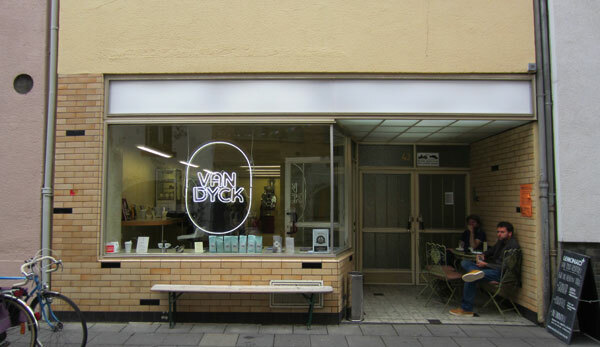 We came across other quirky little design shops and coffee spots along this street and felt pretty pleased with ourselves for discovering this very cool part of Cologne!